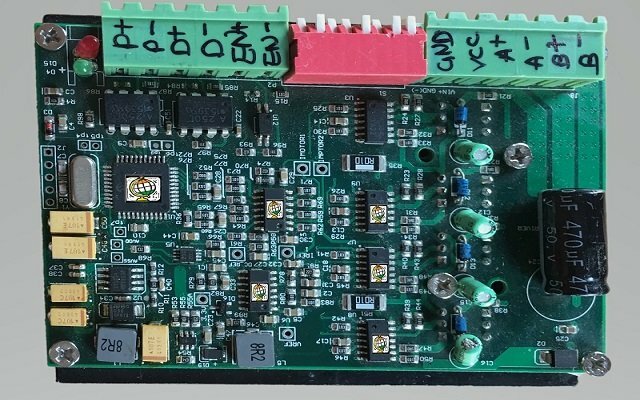 ProDrive is DSP based stepper Drive Device. ProDrive delivers excellent high speed performance with extra smoothness at lower price. Pro DRIVEs are able to drive 2-phase or 3-phase stepper motor from NEMA8 to NEMA42. ProDRIVE also provide over voltage, over current and phase error protection. Support Supply Voltage up to +48 VDC. Programmable output Current up to 3.7 A. Programmable micro steps up to 51200 step/rev. Pulse Input Frequency up to 90 KHz. ProDRIVE gives best performance with ProSYS and it doesn’t require any software to operate. Capable of delivering high performance without damages to your machines or the materials. Support PUL/DIR and CW/CCW modes. Anti-Resonance, provides optimum torque and nulls mid-range instability. TTL compatible and optically isolated input. No need to use any software. Current is tuned with Speed of Motor So less Heat will be generated.